There are great rafts of information published about the Flinders Rangers. Here’s our distilled guide to the essential Flinders Rangers experiences, accommodation and dining options. The ancient rocky landscapes are geographical marvels. Wilpena Pound from the air, the gorges and further north forms of uranium in some rocks are some amazing sights. The best 4WD driving in the country, from easy to extremely challenging, half day to multi day journeys. 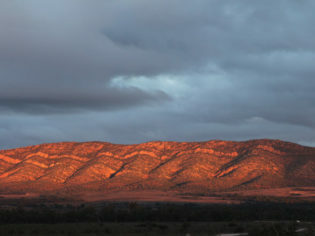 The walking is some of the most pleasurable outback walking in the country. There’s loads of wildlife. The Heysen trail starts here. It’s historically rich. The Manhattan Project scientists were all over the northern Flinders Ranges during the war. Famous explorer Douglas Mawson saw glacial rocks in the Flinders that led him to his more renowned Antarctica expeditions. An outrageously rocky one-way 4WD track has been cut through the Northern Flinders. Piling into the back of a specially designed open top 4WD for the 4.5 hour journey is about more than just appreciating awesome scenery. Guides unearth the amazing geology, flora and fauna in the area. The history of the pioneering characters like Mawson and some of his students (like R S Sprigg who developed the tour) is an insight into one of the many unappreciated eras in Australian history. The highlight is arriving at the fall-off-the-cliff Sillar’s Lookout. Just make sure you’ve been to the bathroom before you leave because climbing to the top is a rough ride and a full bladder is the LAST thing you want. See the Pound at its best with a morning flight around the edges of the bowl-shaped crater – not formed by a volcano or meteor but the earth’s shifting crust. It’s comfortable walking when you have your own guide and a swag waiting at the end of the day. Wine and dinner is done, all you need to do is carry water and lunch. The guides take you to secret treasures of the ranges, catering each walk to your desired comfort level. The full day tour from Rawnsley Park takes you to the spectacular Brachina and Bunyeroo Gorges. Keep an eye out for Yellow Footed Rock Wallabies, Emus and Euros while learning more about the history and geology of the place. The Eco Villas on Rawnsley are the best value accommodation in the Flinders and are indulgent without being excessive. The huge spaces are great for relaxing after a tough day touring, set up with all the amenities you could want. Sit in the big bed and look up at night to see though the skylights to the stars – just magic. Beautifully designed and crafted, the villas are excellently positioned to take in sunrise on the Elder ranges. Well this is living the high life. With just five rooms and a maximum number of 10 guests, this is intimate, exclusive and luxury in the Flinders. The ethos of the station is to make guests feel like a rich uncle has thrown them the keys to a manor and said help yourself. And you do. With a chef on hand for all meals, two hosts and two guides for walking, it’s not hard to enjoy yourself. The 1851 homestead has been beautifully restored and each room has its own quirks. Whether you want a cosy dinner under the stars or a guide-led activity, the ranges are your oyster. More known for its food than furnishings, the hotel has very comfortable and well appointed rooms for travellers. The only downside is that they are on the plains fringing the ranges. There are loads of Camping grounds throughout the rangers. 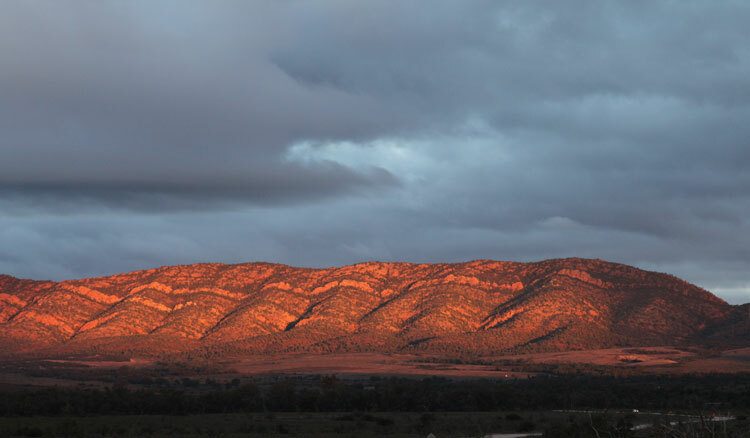 The most well maintained are at Wilpena Resort, Rawnsley Park and Arkaroola. Arkaroola also has cottage and lodge accommodation options. The restaurant in the middle of the outback caters to all tastes and budgets and is a thriving regional hub for all travellers. World renowned for the Feral Mixed Grill where a camel sausage, emu pattie, goat chop and kangaroo fillet are all dished up on the very foreign mash potato. And for dessert the quandong pie is a must. The restaurant has carved out a deserved reputation for serving up one of the great outback meals. The Sprigg Family (RJ started the private Arkarolla Wilderness Are in 1967) have a huge historical connection to the land and were pioneers of tourism in the area. Unfortunately RJ passed away in 1994. His children, Margaret and Doug continue the tradition of preserving a spectacular wilderness and can be found at the homestead on most days. They have great yarns to tell. Tony and Julie Smith are fifth generation Flinders Ranges Pastoralists. Passionate farmers, Tony and Julie have moved their business into the tourism sector. Typical farmer, Tony is quietly spoken but a fantastic operator. He and Julie are legends in the area and if you get the opportunity make sure you buy Tony a beer and ask him about the golden fox of the Flinders Ranges. Like the Spriggs, the Rasheeds are synonymous with the area. Original settlers of the Wilpena Chalet, the twin sons of founder Keith and Dean ran separate entities in the area. Both have sold out of their interests but remain in the area. Keith is still involved in the Air Wilpena operation and is well-known for the pink headband on his Akubra and a pink jeep.